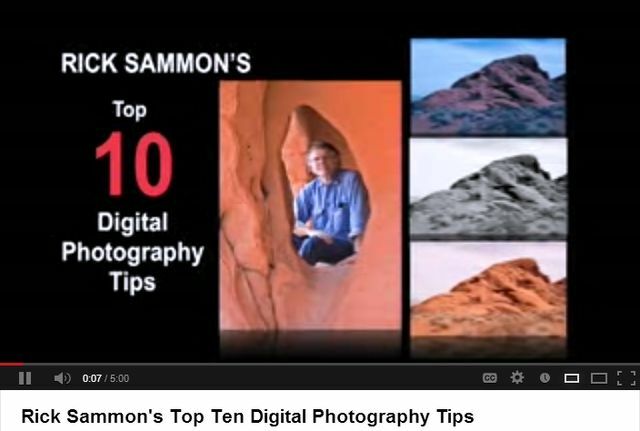 Rick Sammon's,video a professional photographer showing the top 10 ways to take the best photos. "Rick takes us to Valley of Fire State Park in Nevada to share with us his Top 10 digital photography tips"
1. Learn how to see the light. Examine its color, direction, quality, shadows, highlights, and contrasts to set your exposure accordingly. 2. Try to create a sense of depth and dimension in your pictures. Camera only captures two dimensions (height and width). One way to achieve depth and dimension is to use a foreground element when composing a picture. 3. Take a hike! Walk around your subject to learn the various photo angles and possibilities. 4. Always look down, up, and back. There’s always something going on around you. 5. Tell the whole story. Experiment with wide-angle, medium, vertical, and horizontal shots, and look for details. A wide variety of pictures helps to tell the whole story of your subject. 6. Frame it! Find a structure, like a doorway or a window, to frame your subject. This makes the photo much more interesting. 7. Beware of the background. Make sure an object in the background isn’t distorting the shot. 8. Fill the frame. Zoom in and crop all the dead space that doesn’t add any value to your picture. 9. RAW rules. Unlike a JPEG, a Raw image file retains all the photographic information, including highlight areas. 10. Envision the end result. Photography follows the 50/50 rule: 50% image capture and 50% digital dark room development. All rules are meant to be broken. Be creative and modify or break the rules as necessary to achieve the best shot. Thank Rick for the making a great photography video. Mr. Sammon's clarity in the video to me is a sign of a professional. It takes a lot of work to put together a video that is truly helpful. We at Hobo network are now searching YouTube.com for similiar on many subjects. And, we will be posting this type of digested article to assist people, and it takes a lot of work on our side for even this production. And, what do I care, we got the good photography tip?